Posted on 29, August 2016 by EuropaWire PR Editors | This entry was posted in Education, Environment, Science, Sweden and tagged Christer Nilsson, Ecology, Environmental Sciences, land and aquatic environments, Umeå University. Bookmark the permalink. Umeå, Sweden, 29-Aug-2016 — /EuropaWire/ — Humans utilise forests and watercourses in a way that depletes ecosystem habitats, biodiversity and ecosystem services. Many areas are restored to break the trend, but to succeed you need to consider not only the ecosystem in mind, but also surrounding ecosystems. This according to researchers in Umeå in Sweden in an article published in BioScience. “Despite evident correlations between land and water ecosystems, forests and watercourses are nearly always restored separately in small-scale projects. When a forest ecosystem abounding in water has been depleted, it can be a struggle to retain its original status by restoring only one part of it. Instead, both land and aquatic environments need to be integrated in the restoration,” says Christer Nilsson, Professor at the Department of Ecology and Environmental Sciences at Umeå University. Riparian zones along forest rivers are environments where forests and water meet and benefit from each other. The line of trees along the riparian zones provides shade and wood. Leaves and insects falling into the water are favourable for aquatic insects and bugs and eventually also for fish. Floodings wash up sediment, seeds and other plant parts onto riparian forest zones. New plants grow, which increases production and diversity. Aquatic larvae make up a good food source for insects, spiders, crustaceans, lizards and birds on land. Decaying fish carcasses removed from the river by large animals encourage the growth of riparian trees by enriching riparian areas with nitrogen. That in turn helps trees to grow and to shed more branches and leaves into the water. “This natural interplay makes riparian forests key areas for diversity in the landscape. 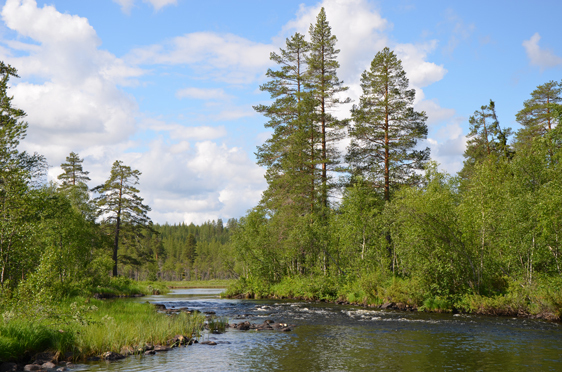 Hence, restoring riparian vegetation is an essential part in achieving great variety of species and making the ecosystem more sustainable at the same time as it makes them more hardy and better equipped for climate changes,” says Christer Nilsson. Climate change has had direct and indirect effects on both land and aquatic environments, but at present the understanding of how climate change affects the interplay between forests and watercourses is insufficient. That is also a reason why that factor is often neglected when restorations are planned. Free-flowing rivers surrounded by natural forest are expected to be more resistant to climate change than streams surrounded by clearcuts or urbanised areas. The study was performed as a part of the research project RESTORE – a collaboration between natural and social scientists.